Just because the menu says it is a children’s portion doesn’t mean it packs the appropriate number of calories for your kid. A RAND Corp. review of children’s portions served at chain restaurants found a´ la carte items on kids' menus averaged 147 percent more calories than the servings recommended by a panel of experts. This is important, said the authors, because restaurants that serve excessively large portions are helping to drive America’s obesity epidemic. The researchers collected calorie data on food listed on children’s menus at the country’s top 200 restaurant chains. The list included a wide range of items, including macaroni and cheese, hamburgers, fried potatoes, pizza, chicken nuggets, soups, sandwiches, ice cream and fruit. They convened a group of 15 experts on children’s nutrition who assessed ideal portion sizes, with a goal of creating a children’s meal that doesn’t exceed 600 calories. For example, they determined that main dishes shouldn’t have more than 300 calories and servings of fried potatoes should top out at 100 calories. Fried potatoes, such as fries and tater tots, on the average, exceeded recommended calorie levels by 287 percent among the 51 franchises surveyed. Burgers exceeded recommendations by an average of 155 percent at the 44 franchises examined. Chicken nuggets or chicken tenders exceeded caloric recommendations by an average of 142 percent at 52 franchises. Ice cream servings packed an average of 241 percent more calories than recommended by the nutrition panel. The only food, in fact, that came in under the recommended levels was a child’s serving of fruit, which carried an average 69 calories, or roughly half the amount recommended by the nutritionists. The highest-calorie entrée the investigators found was a meal of two mini Angus cheeseburgers served by an unnamed chain. The burgers together weighed in at 1,170 calories. The chains most likely to serve kids’ portions exceeding 600 calories, the authors reported, are Friendly’s, Carino’s Italian Kitchen, Max & Emma’s and Uno’s. “McDonald's was the only franchise that offered fried potatoes in 100-calorie portions, which is the maximum serving size recommended by the panel,” the authors wrote. Most customers don’t notice calorie labeling or don’t consider children’s portion sizes, so restaurants should work harder to reduce serving sizes to recommended levels, according to the study’s authors. That will help America attack the problem of obesity, they said. “Developing portions that meet nutritional needs of our youth yet do not increase their risks of obesity and diet-related chronic diseases should be a goal that all restaurants strive to achieve,” said the authors. Providence has many resources to help guide your family’s nutritional choices. 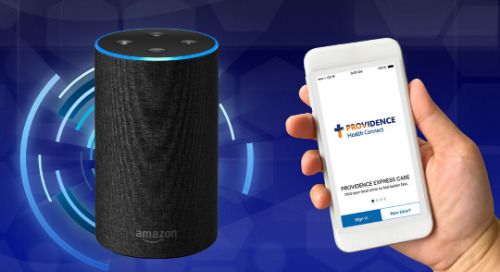 You can find a Providence provider near you by using our multistate directory. The American Academy of Pediatrics hosts HealthyChildren.org, which has a page on Portions and Serving Sizes for children, based on children’s ages. Choose items that are grilled or baked instead of fried or breaded. Look for low-calorie dressing options. You might be interested to read about a new project at Penn State University, which is studying why some children are more prone to weight gains than others, and how children’s brains respond to portion sizes. The Rand Corp. study, “Kid’s Menu Portion Sizes: How Much Should Children Be Served?,” was published in Nutrition Today.